Do you do okay in tight spaces? Ever feel like you have just entirely too much free space? You’re not claustrophobic, are you? If you’ve answered yes to any or all of these questions then I highly suggest watching the astonishingly good film, Buried. Putting this into the horror section of your local DVD rental establishment almost seems like a stretch, but not putting it there doesn’t seem quite right either. Oh well, you can judge for yourself. I just hope you’re not squeamish. Buried, which seemingly went almost unnoticed in 2010, stars Ryan Reynolds (Smokin’ Aces, Blade: Trinity), a cell phone, a lighter, and a wooden coffin. Paul Conroy (Reynolds) is an American truck driver working in Iraq in attempt to make some good cash for his family. His truck is attacked when it is mistaken to be involved with military personnel. Of course, we learn this through dialogue between Conroy and the random people he talks to with the cell phone that has been buried in the coffin with him because, like I said, there is only one actor physically present for this flick. And, oh yeah, to the fun part. Conroy’s captor is in contact with him via the cellphone and his message is clear – find someone to pay the ransom or die somewhere in an Iraqi desert, buried in an unmarked grave. And work quickly because oxygen is in limited supply. Rodrigo Cortes (director and writer of…well, frankly, a lot of things that I’ve never heard of) creates a darkly (literally) terrifying atmosphere with a fast-paced story line, uniquely driven by a thrilling performance from Ryan Reynolds. Seriously, it’s him in a box with a lighter and a cell phone for 95 minutes. The first three minutes of which are just of him screaming while attempting to claw his way out of the coffin after he wakes up. Pretty disturbing stuff. This is definitely a film worth watching…if you’re not afraid to go inside the box. 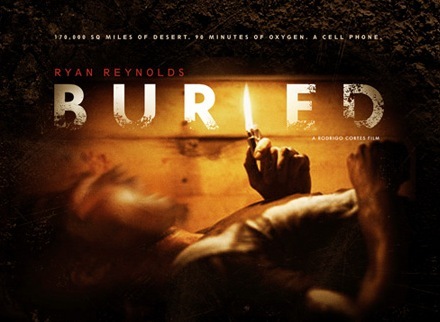 Click here to watch Buried on Amazon Instant Video. 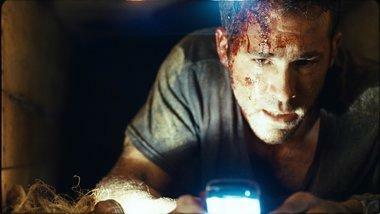 Buried, movie, review, Ryan Reynolds.